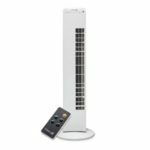 Keep your cool this summer by choosing one of the best oscillating tower fans. 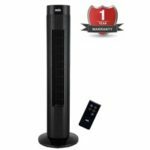 Using an oscillating tower fan to keep cool is an effective and one of the cheapest ways to keep cool, even if you had a powerful tower fan. On the other hand a portable air con unit will be more effective but the running cost will be a lot more. 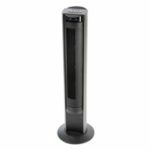 Since a tower fan only blows around the air, unlike an air conditioning unit which actually cools the air, you can pick up a cheap tower fan which is still powerful enough to cool you down. Unless we’re experiencing an extreme heatwave, the UK generally won’t get temperatures hot enough that you feel a powerful tower fan won’t be able to handle. If you feel a tower fan isn’t powerful enough to cool down a large room or garage, but an air conditioner is too expensive, then consider a high velocity floor fan. 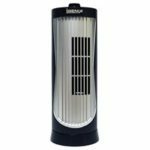 These powerful fans are commonly used in gyms, warehouses and offices, but they’re also perfect for home use. 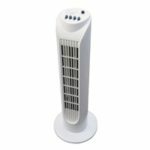 When winter approaches, unless you choose a tower fan that can distribute hot air, you might need a ceramic tower heater to replace your cooling fan. Just like with a cooling tower fan, a tower fan heater can also save you money on your energy bills. 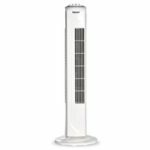 Unless you’ve lived in a country that receives more sun than rain then we understand that a tower fan will probably be the most used appliance in the household during the summer, therefore it’s important that we help you choose the best oscillating tower fan. Speed settings – Most will have 3 speed settings, so you can set how powerful you want the fan to be and can select a lower setting for when you’re sleeping. 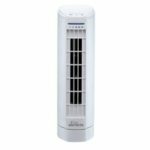 Mini desk tower fans usually only have 2 speed settings, so they can be ideal for sleeping or if you’re short on space. Wind modes – The different wind modes are designed to accommodate those who prefer a different breeze from the standard constant wind speed. There will usually be a sleep mode which stimulates a comfortable sleeping breeze. Timer settings – A tower fan with a timer is one of the more important features as most people who sleep with the fan on, don’t feel the need for the fan to be left on once they’ve fallen asleep. With a timer in place, you can save on your electricity bill and save yourself from waking up in the middle of the night feeling cold! Timer settings vary by model, some will allow you to set the timer in increments of 30 minutes, whereas other models will only allow you to select a fixed set duration. Remote control – If you’re in a comfortable position either in bed or on the sofa then having a tower fan with a remote control is perfect for changing the settings without having to move. 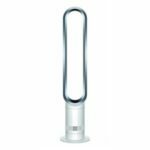 Oscillating – This feature is commonly found in most tower fans, even a cheap tower fan will be able to oscillate. 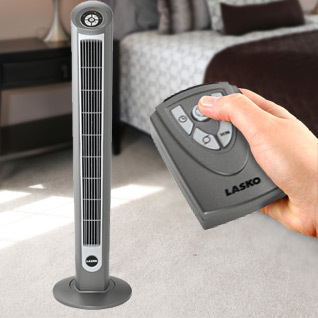 Activating oscillation will cause the fan to rotate to cool more of the room. Rotation angle will vary depending on the model but it’s usually no more than 90 degrees. 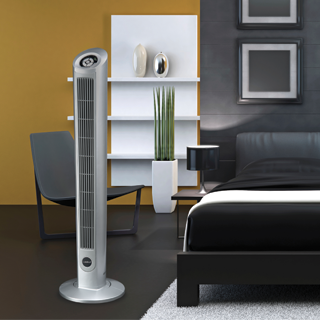 Height – Tall tower fans may be able to produce more wind as the fan component inside is usually longer as well. Weight – As you can see most don’t really weigh much so it can easily be moved from one room to another. 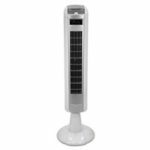 Mini tower fans are very portable due to their smaller size.